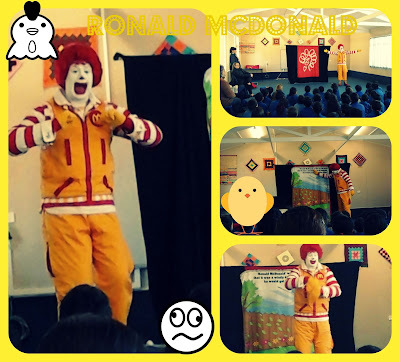 On the 11th of August years 1-6 went to the multi purpose room for the Ronald McDonald show. There were special guests like Mika from room 12 and Kate Ronald McDonald’s friend. He lost his sock while he was hanging his washing so he decided to look for it on the way to our school and on the we sang make it click and stop look and listen.